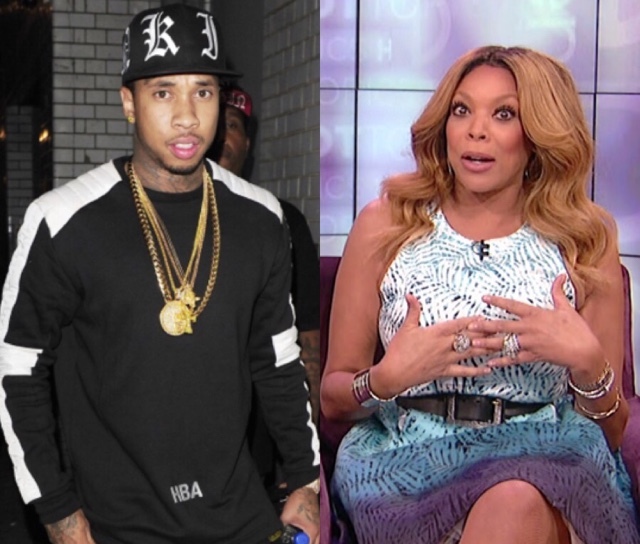 Tanea Moniquex | Celebrity Entertainment News, Fashion, Music and Advice: Wendy Williams slaughters Tyga! Wendy Williams is known for saying it like she means it. So during a segment of her Hot Topic's, the talk show host accused Tyga of having a rented lifestyle and being mentally challenged! "There's a new reality TV show that I don't care about on an account that everything about it seems fraudulent," She continued. "The rapper, Tyga ... A reality show... Now as a friend to the show Sandra Rose would say, "The Washed up rapper, Tyga! ", which I don't know enough about him to know if he's washed up or not but I know him for dating a underaged child, more than about his music. He's dating this child ..."
Tyga has been catching heat for months about his alleged relationship with Kylie Jenner. Rumor has it he's been secretly dating her since she was 16-years old. "Now can we talk? I don't believe a word of any of that status-y stuff is his ...I think that entire lifestyle is rented," Wendy told her audience. "I don't care about this show but how I would care is if this under age child showed up, so we can check that out and if his baby mother Blac Chyna showed up." " ... I'm suspicious of old men who date young girls... I don't mean old if you're like 80 dating a 50-year-old or 50 dating a 30-yearold. I'm talking 25 dating a 17-year-old, there's something wrong about that, that says, okay, he's got a tick where he can't compete with a girl with a college degree his age. Mentally speaking he's not on our level, so he's got to date a child because a child will worship him and listen to every word he says. And to me that says a tick that where her father, her mother or Caitlyn needs to talk to your daughter about the mentality of a 25-year-old, single father dating your 17-year-old."